Always use flexible silicone coated wires for all connections. Take care with soldering and doublecheck for cold solder joints, shortcircuits and reversed polarities before hooking up or running the ESC for the first time. A shortcircuit or reversed polarity input can destroy the ESC. Cover the ESC in a good quality Heatshrink tube to insulate the ESC and secure capacitors and wires from suffering a fail or shortcircuit due to stress or fatigue. The USB is a Micro-B type connector. It uses the internal USB controller in the main processor. 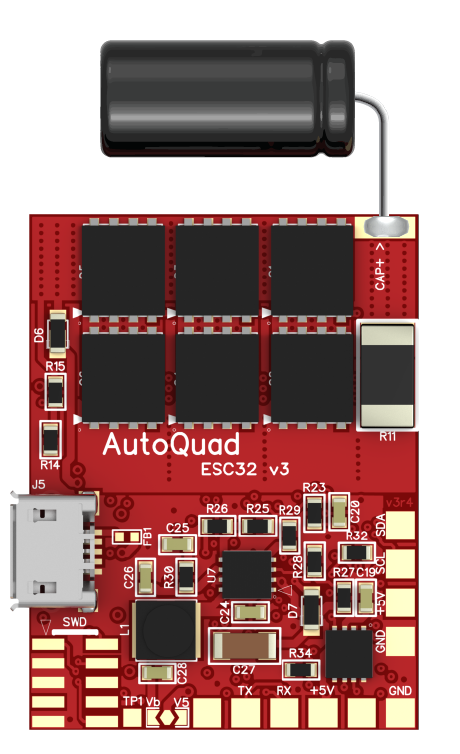 Windows USB Driver for ESC32 v3: To connect using ESC32 v3 native USB connection on Windows, the STM32 Virtual COM Port (VCP) driver is required. 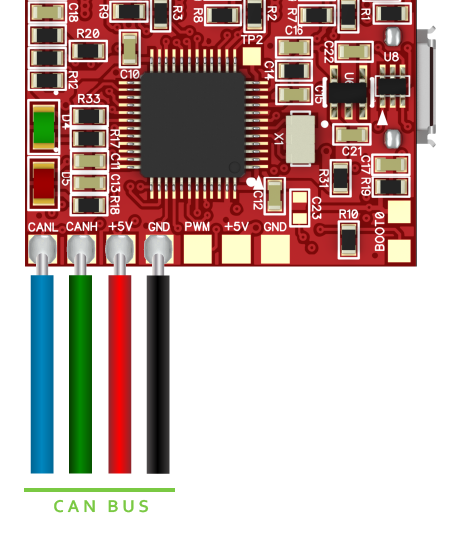 If Windows does not recognize the ESC32 v3 as a device when it is plugged in, please download and install the drivers from STMicro, found here: http://www.st.com/web/en/catalog/tools/PF257938. Mac OS X and Linux do not require driver installation. The suggested input wire for loads up to 20A is 16AWG. Increase or decrease according to intended load. Always twist the supply wires, specially on longer lenghts. This reduces induction and magnetic fields created in the supply wiring and puts less strain on the input capacitor. Connect battery power to the + and – pads on the top side of the ESC32v3. A high current reverse polarity input will destroy the ESC instantly!! The capacitor is a vital part part of the ESC´s operation.Good quality capacitors from known brands with low ESR and correct voltage ratings are mandatory for proper operation of ESC32v3. Note that Electrolytic capacitors are polarized. The short leg with the band goes to the negative terminal. ESC32v3 is supplied with a Low ESR Panasonic 330uF/35V capacitor (EEUFM1V331). This is suitable up to 5S and maximum 20A burst loads with supply wires up to 20 cm. The amount of capacitance needed depends highly on power and the lenght of the supply wire. So the more power is dumped through them, or the longer the supply wire is, the more capacitance is needed. In general if you double the load, you should double the capacity. Add another 100 uF per 20 cm of added supply the wire lenght. Using low ESR (Equivalent Series Resistance) capacitors is vital for proper operation. A capacitor can only dump or charge as fast as its internal resistance allows. Low ESR is more important than high capacitance. In general a ESR of 0.05 ohms or lower is considered “low ESR. Active freewheeling means that the capacitors are rapidly beeing charged and discharged each time the motor decellerate or accelerate, so its important they can cope with the load. Choose name brand capacitors rated for operation at 105 degrees celsius or more with long endurance. Two smaller caps connected in parallel will in general terms have double the capacity and half the ESR compared to one single large capacitor of equal capacitance. So its better to use 2 small caps in parallel than one single big one if you need to dump a lot of power through them. CAN wires are connected to the CAN-H, CAN-L, GND and 5V pads on the bottom side of the ESC. The power for the logic of ESC32v3 can come both from 5V or main battery supply. Since its supplied by a Buck converter there is no problem with supplying the power to the logic from the main battery. 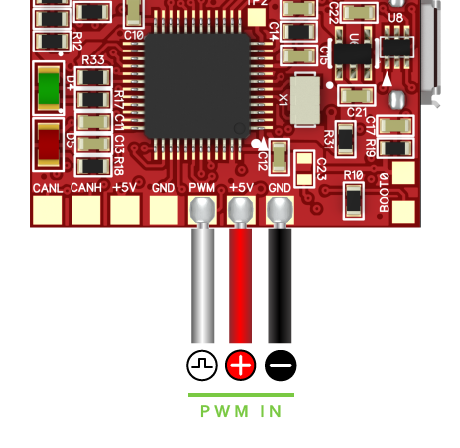 Even with Vbat side closed, you can still supply 5V onto the PWM, Serial or CAN interface and power the logic this way when main battery is disconnected. 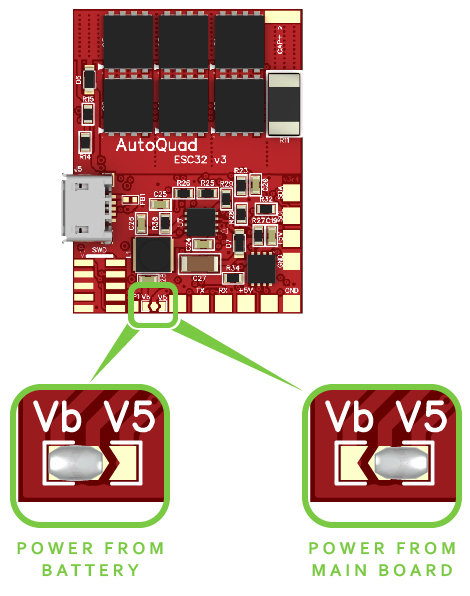 This can be handy if you need to configure the ESC without main power connected. This page was created on 11-Aug-15 by jussi. Last modified on 26-Aug-15 by MaxP.